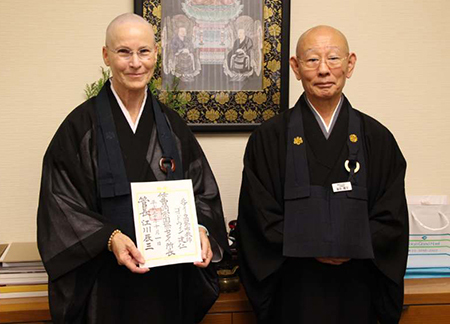 On October 1, Konjin Gaelyn Godwin Roshi was appointed the new Director of the Soto Zen Buddhism International Center. She is both the first woman and the first Westerner to hold the position. Konjin Roshi is the Abbot and Abiding Teacher of Houston Zen Center. She trained at San Francisco Zen Center for 18 years, many of them at Tassajara. She moved from Green Gulch Farm to Houston in 2003 at the request of the Houston Zen Community where, together with the Zen community, she helped establish the Houston Zen Center, a thriving and diverse urban refuge in the heart of Houston for the study of Zen. San Francisco Zen Center extends great congratulations to Konjin Roshi! We wish her success in her new position.